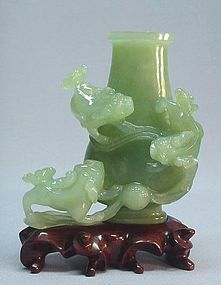 This bowenite carving of a vase with three mythical animals, Qi Lin, is 5 1/8” high (with fitted hard wood base it is 6” high), 4 ¾” on the widest part and around 2” thick. There is a stamped date on the wood base of Sept. 2004. 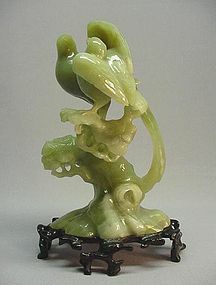 The carving depicts three Qi Lin playing with ribbons and a ball. It is in excellent condition. This contemporary bowenite carving of two birds resting on a garden rock is 8 ¾” high (with fitted wood base it is 10” high), 5” wide and 3” thick measured from the bottom and 5” thick measured from the birds’ wings. It is in excellent condition.